No one is in the diner, except for Pedro and me. Nothing moves but the cigarette smoke as the sun rises and we pass a lighter between us. The sky is pastel and soft over a sleepy Clemson, South Carolina. It’s summer. The students are mostly gone and the roads are sterile for hours at a time. The hours drag. 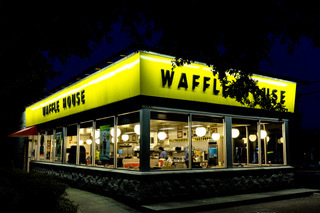 At this hour, Waffle House is either empty or hosting odd, lonely truck drivers who keep their sunglasses on their foreheads, nurse an All Star Special and over-milk their coffee for an hour before leaving an extra dollar behind them and returning to the road. Four days a week, Pedro and I do this at the end of our shift, mostly cleaning and airing complaints among service workers. Pedro doesn’t talk much about his past. He tells different stories each time people ask him, and the unreliable nature of his answers makes it hard to even know where he’s from. He seems to have arrived in the states through Miami, and he consistently reminds the staff that he’s an immigrant. He has a rap sheet. He’s been incarcerated for drug trafficking and assaulting a police officer. He spent 15 years in prison before being released on good behavior. Ever since, he’s bounced between food service and construction. That’s not surprising in a Waffle House. The company takes pride in employing felons. It makes the staff colorful, and it’s hard to find enough bodies to staff a 24/7 operation. A line cook on first shift doubled as the second largest meth dealer in Pickens County, according to him, anyway. A server was dealing acid and coming to work tripping more often than not. He would tell me about the spatulas melting in front of his eyes. A shift lead was prepping for a hearing on an assault charge. I was just a college kid. Nineteen and trying to keep from atrophying from boredom between semesters. I sought refuge from my partner’s mood swings. I slept all day while the roof in my apartment was loudly replaced, and crawled back into Waffle House every night for nine hours. I would leave aching everywhere, exhausted and barely awake enough to drive the half-mile home. Third shift was high-energy. High-stress. I would sweat all my makeup off by morning. When we worked together, Pedro would make off-menu French Toast. It was in those early hours that Pedro and I really became friends. We cleaned side-by-side for hours after the bar crowd went home. He told me about how people didn’t think he knew that they looked down on him. “They think I’m stupid,” he would say. He told me he got paid less than the other line cooks, despite having more training. “They only got one brown guy here. It’s me,” he said bitterly one night, while he cleaned dust off the ceiling tiles. He stood on a chair, because Waffle House didn’t have step ladders. I cleaned the globe lights while he worked, wincing every time he wobbled. No one else would clean the place the way the pair of us would on lonely nights, he told me. It would be nasty without us. People thought Pedro couldn’t be trusted, that he came to work high, that he cared only about pot, that he was lazy, that he was slow. They whispered about where he came from. Really, Pedro worked hard and laughed loud and deep from his chest. He told me stories about prison – giving himself a stick and poke tattoo of a heart locket on his chest. It was surprisingly symmetrical. Sometimes, he would get off at 4 a.m., when it was still pitch black outside, and go fishing. He’d take a six pack of cheap beer and stay out there until noon, sometimes dozing with the push and pull of the lake. He knew what people thought of him. And here we are again, watching the sunrise. We smoke while we watch an officer in a patrol car pull someone over in the McDonald’s parking lot across the street. The officer asks a young kid to step out of the car. The blue lights paint the dark asphalt, almost reaching fully across the street. I wince, recalling my past speeding tickets, and tell him I avoid the police whenever possible. He tells me they give him high-fives in Walmart, make sure they stop by Waffle House when he’s working. They know him. They know his name. Pedro pauses for a while. The sky is starting to turn a soft blush, and soon the sun will crawl up. Another nine solid hours of Waffle House. I watch him blow smoke up towards the yellow and black awning. We watch the sky turn pink, and the patrol officer finally leaves with the kid riding in the back. The kid’s car stays behind, sitting isolated in the middle of the McDonald’s parking lot. Pedro and I crush our cigarettes into a parking space full of them. I tell him the game is wrong, unfair. I tell him that he shouldn’t have to know every cop to avoid being shot accidentally. I’m not saying anything new or deep. But sometimes it’s still necessary to say out loud. The sun inches over the tree line, and suddenly everything is gold. There are still hours to go before either of us will sleep.